Mort Kunstler Handsigned and Numbered Limited Edition Giclee on Canvas:"Negotiating the Jay Treaty"
About the Art: The French Revolution of 1789 divided Europe and engulfed the world in almost three decades of war. In time, it would also transform politics in the United States. At first, most Americans agreed that the overthrow of King Louis XVI and the apparent establishment of democratic rule in France was a good thing that boded well for the United States. As the revolution descended into the Reign of Terror after 1793, however, Washington drew back in disgust from the violence and bloodshed, even as Jefferson and his friends defended it as a necessary step on the march toward liberty. 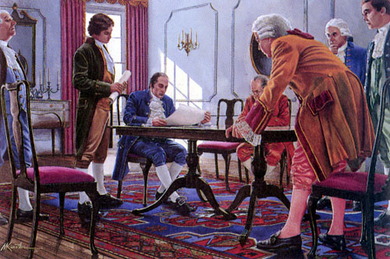 Washington declared neutrality in the burgeoning contest between Great Britain and France; his Farewell Address of 1796 would provide the maxim that "the great rule of conduct for us in regard to foreign nations is�to have with them as little political connection as possible." Even so, he thought it important to take steps toward normalizing relations with Great Britain, whose stable political system he continued to admire.